What about reducing the retirement age to 52 ? "All petrol stations have fuel" …or have they? Unfortunately for all French road-users, France's secretary of state for transport Dominique Bussereau's attempt to reassure French citizens on Sunday, has poorly failed. In a bid to reverse the government's plans to raise the retirement age, striking French oil-refinery workers have cut the fuel supply not only to Paris airports but also to nearly 400 petrol stations, by blockading fuel depots. This wave of protests has raised fears of a fuel shortage which could paralyse the whole economy. The government, however, claims it will not be backing down on the unpopular pension plan, which will raise the age of retirement from 60 to 62 (early retirement with reduced pension) and increase the state retirement age from 65 to 67. The reform is said to be the only way to stop a 32bn Euro annual pension shortfall ballooning to 50bn euros by 2020. But both the unions and the Socialist opposition claim that Sarkozy is making workers pay a heavy toll for the financial crisis and have made alternative proposals for funding the deficit. The French senate is due to vote on the reforms on Wednesday, the last step needed to pass the reform. 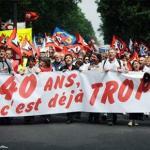 Are French people supporting the strikes? Polls are so contradictory that it is impossible to draw a clear conclusion about citizens' support for the strikes; the fact is that several millions of demonstrating workers and students have expressed their opposition to the president's plan last week. Moreover, twelve oil refineries remain on strike and 11 are blockaded by unions. France's petrol pumps could run dry by Wednesday, and the country's oil industry association UFIP warned that if strikes were to carry on 12 of France's refineries then there could be a national shortage. In order to calm the population down, the French oil giant, Total, announced that less than 3% of its 13,000 petrol stations were experiencing supply disruptions. Unfortunately, this was not enough to stop a rush towards petrol stations. Paris was the hardest hit. Some members of the general public started expressing their anger this weekend: "It is unacceptable to undermine the freedom of movement and work of the population. Even though I support the movement against pension reforms, these people cannot take the country hostage" said Sylvie, 50. Another critical problem remains with Parisian airports being some of the worst affected. Orly and Charles de Gaulle are both cancelling flights. Orly has cancelled half its flights. Airlines have informed pilots that they should refuel abroad. Concerned by the idea of a potential national paralysis, Prime Minister François Fillon declared whilst being interviewed by TF1 television channel “I will not let the French economy be choked by a blockade of fuel supplies” and continued “The right to strike is respected, but this is not the right to block access to fuel, or to deny non-striking workers access to their workplaces”. What strikers are also claiming is that it is not simply about chocking the economy, these marches are designed to ask for social justice. The 'bouclier fiscal', a tax cap introduced by Sarkozy immediately after his election in 2007 - when the financial crisis was not yet shaking the world’s economy - is harshly criticized by the opposition. It established an upper limit on the amount of tax a person might be required to pay. Of course this measure was particularly appreciated by the wealthiest French citizens. Strangely enough, now that France is in the middle of a financial meltdown, the Minister of Budget, Francois Baroin also agreed that this measure "epitomizes social injustice". Could the abolition of the ‘Bouclier Fiscal’ for this retirement reform be a fair bargain?